Educate and provide the students with science and knowledge of biomedical equipment by the best method and qualify, to quality creative competencies and developed skills, science and behavior .To facilitate and support the scientific research due to its benefits for the community. 1-Apply knowledge of mathematics, medical sciences basics and technology concepts to identify and get the solution of biomedical equipment problems. 2-Apply leadership/management principles, techniques and tools in promoting/directing care in medical sciences practice and spreading medical awareness in preventive medicine. 3-Conduct experiments as well as analyzes and interprets data. 4-Communicate effectively while working within multi-disciplinary teams. 5-Consider the impacts of technology solutions on society &environment. 6-Demonstrate knowledge of contemporary technology issues. 7-Display professional and ethical responsibilities and contextual understanding. 8-Engage in self- and life- long learning. 9-Use accumulated knowledge to provide advice on the selection, operation, supervising performance, testing, and maintenance of medical equipment in clinic and hospital environment. 1. Biomedical equipment program is considered are of the oldest programs among Egyptian governmental and private universities. 3. Presence of scientific and academic cooperative protocols with Fontys University to exchange educational experiences. 4. Presence of distinguished academic and scientific experiences due to the apprectiation and encouragement awards gained by teaching staff members for their distinguished scientific research. 5. Active social participation by program staff and students through health awareness seminars, various seminars in different fields and the therapeautic convoys through out the whole contry. 6. 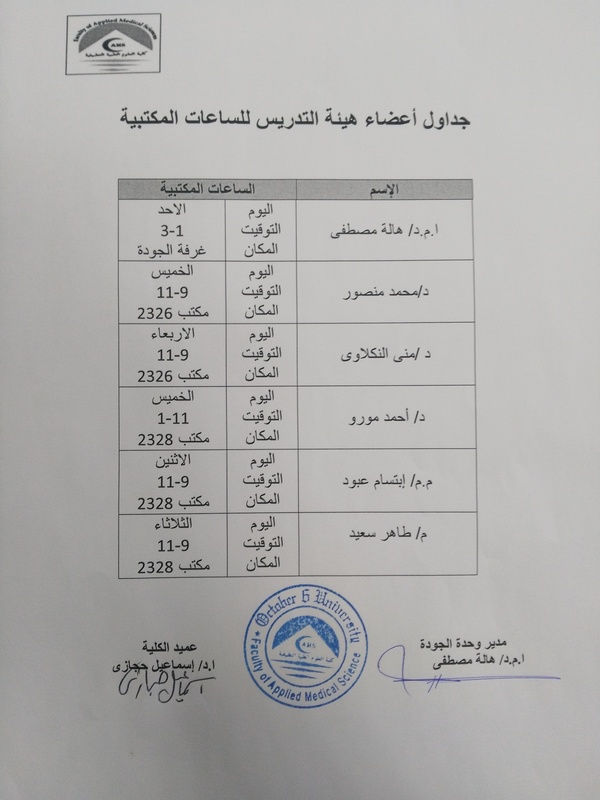 Specialized rooms and labs in mathematics, biomedical physics, electrical circiuits, and electronics departments equipped to accommode 25 students which improve educational process. 7. Special unit is provided to serve society and developmental cases which is responsible far providing renewable resonnces for the facality through cooperation with productive and service points in the society. 8. The program is distinguished with fast containous development in the biomedical equipment field which has its impact on the graduates in terms of countinous collection of skills and knowledge. 1-Preparation of specialists with good medical background to work in the field of maintenance and marketing of medical equipment from all countries. 4-Providing high quality education that concentrates on active use of information technology. 5-Acquisation of students to satisfying skills, continuous learning and knowledge with different parts of medical equipment, and keeping up with the development in its technology. 6-Improving and developing to educational systems by creation educational environment that achieves creativity and elevates quality and efficiency of education. 7-Preparation of graduates capable of doing periodic and preventive maintenance, calibration and quality assurance of medical equipment in addition to purchasing and detection of faults. The study of computer technology is continued. Data presentation and structure, development of computer programs in medical equipment are to be stressed upon. DICOM and PACS. Data acquisition and information technology. Radiology Information Systems (RIS), Hospital Information Systems (HIS), and display workstations. Passive electric circuit components, connections, and behavior with DC supply. Linear circuit analysis. Behavior with DC supplies. Resonance circuits. Three phase circuit filters. Computing integrals, area and volumes of the region of interest in images, 3D's display of organs. and application in optimization and linear programming. Analysis of electrical components varying with time. Introduction to differential equations and modeling. Optimization and Introduction to signal processing. The concepts of derivative, rate of change as the derivative, curve sketching, second derivative and concavity, applications of experimental function. The course is intended to give an introduction to bioelectronics and biopotential. Origin of bio-potential electrodes and amplifiers. Data analysis. design, op-amp circuits, and active filters. Measurement of blood pressure and sound. Measurement of blood flow and volume. Measurement of respiratory system. Transformers, Dc generator and motors: principle of operation, field excitation, armature winding, load characteristics synchronous machines, induction motors. Special machines: stepper motor, reluctance motor, hysteresis motor, power diodes, silicon controlled rectifier triacs, power amplifiers. Control of electric machines UPS system. Hospital based clinical engineering: quality control. Acquisition of equipment, technical assessment, hospital organization, data analysis, inspection and test of medical equipment. Inventory control. Preventive maintenance and inspection. Training programs. Safety in hospital: electrical, mechanical, biological, radiation. Transducers, signal conditioning, and recording. Displacement measurements: resistor sensors – strain gauge bridge circuit, inductive sensors, capacitive sensors, piezoelectric sensors. temperature measurements: thermocouples, thermistors, radiation thermometry, fiber optic temperature sensors. Optical measurements: radiation sources and sensors, geometrical and fiber optical filters. It provides an introduction to medical instrumentation systems, modes of operation, constrains, classification, interference, and modifying inputs. Compensation techniques. Medical instrumentation characteristics. Design criteria. Statistical methods of instrument accuracy. Boolean algebra and truth table. Combinational logic circuits. Sequential logic circuits, multiplexers, and read/ write memories. Analog – to- digital convertor (A/D) and applications. Digital – to- analog convertor (D/A) and applications. Address decoding hardware. Digital arithmetic's. This course provides the basic knowledge about: electrotherapy equipment, types of electro stimulation equipment, indications and contraindications of electro stimulation, the orthotics of the upper and lower limbs and the spinal support. neuro muscular stimulators, hearing aids, Baby incubators and heart lung machines . Drug delivery devices. systems (ICU monitors and workstation). Principle of digital signal processing digital filters. Biotelemetry. ADC/DAC, modulation demodulation, feedback theory, practical op-amp limitations, oscillators, multivibrators, timers, and waveform generators. LEDs, and semiconductor lasers. Signal Conditioning Circuits, Signal Amplification, Microarrays & Nanoscale Arrays, Nanotechnology I-C analysis MOS, FET, and bipolar transistors.VLSI Circuits MOSFETs, their characteristics and use in analog and digital circuit. Solar Cell. ICU monitors, Digital filters. Electronic methods: potentiometry, conductometry, colography. Spectrophotometry. Automated chemical analyzer. Chromatology. Electrophoresis. Hematology. Equipment calibration and maintenance. Recording devices: strip-chart recorders, magnetic tape recorders, and digital recording. Biochemical lab apparatus: spectro- photometer, PH meter, cell counter, and blood gas analyzers. Physiotherapy and hyperthermia: microwaves interaction with body, hyperthermia unit. Medical imaging: ultrasound, X-ray. Services. Inventory control: interaction with drug industry, equipment control. Principles of operation and design of: cardiac pacemakers and electric stimulators. Defibrillators and cardioverters. Haemodialysis. Ventilators.. Surgical instruments. It provides the basic knowledge about medical endoscopes which are used in diagnosis and surgery and peripherals which are attached with them, it look briefly at their principles of operation and design. It define some fundamental terms to use in describing the characteristics of medical imaging systems. It is directed to the basic concept of biomedical instrumentation and medical device. Main focus is on the virtual instrumentation in biomedical engineering using the latest computer technology. Causes of errors, types of errors, evaluation of instrumental function, principles of Preventive maintenance. Protocol of preventive maintenance. The project will be performed in teams of 2-4 students under the supervision of faculty staff members. Students are introduced to design, fabrication and analysis of medicine scale project with demonstration of product feasibility through the development of a prototype. Material science: nature of metals and alloys non metallic materials. Plastics, ceramics, porous structures, composite material. Mechanical testing, friction, wear and lubrication properties of biological materials. Biocombustability. Bending, fatigue properties. Standard specifications. Implant materials. Structure within hospital: clinical departments, administration and accounting, nursing, information handling, support services. Quality control: Biomedical engineering department: interaction with physician, interaction with nursing, preventive maintenance program, equipment control programs. Diodes and transistors. Rectifier circuits. Transistor as an amplifier and as a switch. Operational amplifier, differential amplifier, comparators. Active filters. Logarithmic amplifier. Differentiator. Integrators, modulators and demodulators. Oscillators. This course focuses on the tissue characterization.The course gives an overview of image acquisition techniques, such as image filtering and enhancement, feature extraction, image enhancement, image segmentation and classification. Biomedical applications. Digital images. Image quality. Tomographic reconstruction algorithms. 3-D display of organs. Picture archival and communication systems. The specific topics will include various algorithms for image enhancement, image segmentation , restoration and image registration. Complex and random signals. Discrete Fourier transform, Fast Fourier Transform (FFT) algorithms. Spectral analysis Fourier series Digital and adaptive filter algorithms . Applications; processing of bioelectric signals; image and speech processing, estimation of echoes. This course provides the student with the basic knowledge of the physical principles of ultrasound. It examines how diagnostic ultrasound works (how it is generated and how it interacts with tissues. It covers the instrumentation used to transmit, receive and present echo information and the application of these to the practice of Diagnostic Medical Ultrasound. The course include three-dimensional applications, diagnostic images and the workings of ultrasound technology. Students operate and maintain ultrasound machines and practice. The student will understand the role of sonography compared to other Imaging disciplines. In this course physiological signals will be explained. Electrocardiography, electroencephalography, electromyography and electroretinography. Physical, chemical and biological principles for biomedical measurements. Modular blocks and system integration. Heart sounds, cardiovascular system dynamics. blood pressure and flow measurements, cardiac output measurements, and respiratory function measurements. Pulse oximetry. Patient safety. The course gives theoretical and practical aspects, including collector design, modeling of solar systems, economic evaluation of solar alternatives, and photovoltaics. The course offers training on how solar energy works, the difference between solar thermal systems and solar photovoltaic. This online course will provide the student with the fundamental knowledge of photovoltaic system design and installation. It learns the fundamentals of how medical equipment use energy, and how to reduce the energy consumption. Methods of making medical equipment more energy efficient will be covered. Explain the CT Components and Instrumentation. Use of console, menus and default scan protocols. Identify the Technical factors and Parameters in CT image formation. This course aims to combine an understanding of intelligent systems, whether technological and biological, with a knowledge of relevant modern technologies, theories and techniques. This course is distinctive in that it gives an overview of the computational and the human aspects of intelligence. It gives an Introduction to core ideas in Artificial Intelligence including search, logic and deduction, reasoning systems, knowledge representation, expert systems, planning, machine learning and language understanding. It presents artificial intelligence as a coherent body of ideas and methods to acquaint the student with the classic programs in the field and their underlying theory. Students will explore this through problem-solving models, logic and theorem proving, language and image understanding, search and control methods, and learning. Introducing students to the basic concepts and techniques of Artificial Intelligence. To gain experience of doing independent study and research. This course provides an overview of the materials, safety and equipment issues encountered in the practice of biomedical engineering. The course will address molecular probe engineering, nanomaterials characterization techniques, separation sciences, and applications of nanotechnology in biological detection, sensing, and imaging. · Understand, explain, and discuss scientific papers in the area of molecular engineering and nanotechnology. · Apply nanotechnology and bioengineering approaches to future research and design projects. This course is designed to provide the student with an introduction to the field of magnetic resonance imaging. This course will include an overview of the history and development of MRI, fundamental principles, equipment, and safety, image formation, hardware used in the acquisition of images, processing MR images, and production. The course provides information in the use and manipulation of the hardware and technical parameters used in the generation of images. Students completing the course will have a basic knowledge of MR imaging fundamentals and applications. This course introduces the student to a knowledge base necessary for the management of mechanical ventilation to include: types of mechanical ventilators, modes of ventilation and problem solving of various ventilators. This course gives instruction in Mechanics of ventilation, respiration, gas transport, and neurologic control of ventilation will be stressed. It also emphasizes the skills involved in the management of mechanical ventilation to include modes of ventilation, physiological effects, monitoring, blood gas management and interpretation and performance of electrocardiograms. this course places an emphasis on the monitoring and care of the patient in the critical care unit. Topics include: ventilator graphics, non-invasive monitoring, and hemodynamic monitoring. This course further emphasize the skills involved in the management of mechanical ventilation to include: types of mechanical ventilators, modes of ventilation, blood gas management and interpretation.